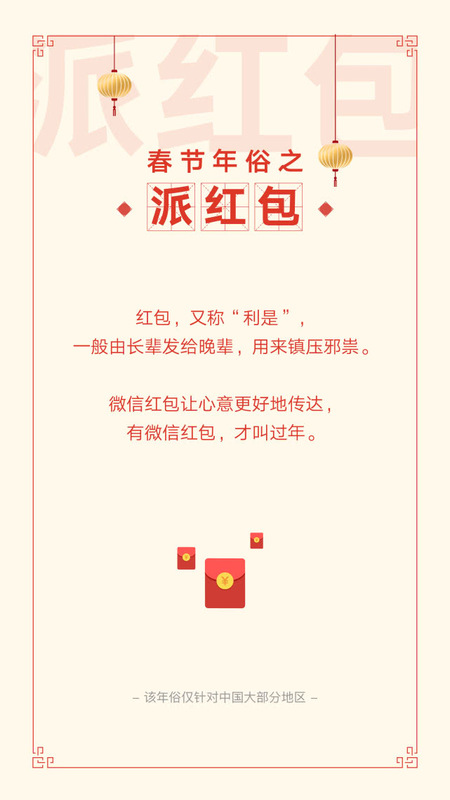 “New Year's Eve, Watching the Spring Festival Evening, Red Packets”, etc. The Spring Festival has a complete record of the happy times of the Chinese people. As people's living standards improve and the cultural environment changes, the Spring Festival is also constantly changing. 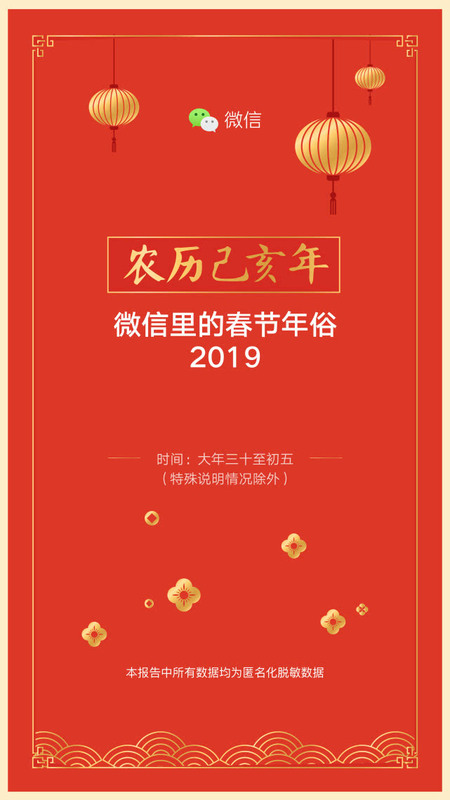 On February 10th, WeChat officially released the 2019 Spring Festival data report, and began to interpret the Chinese New Year from the necessary activities of the Spring Festival, such as New Year's greetings, red envelopes, relatives and holidays. 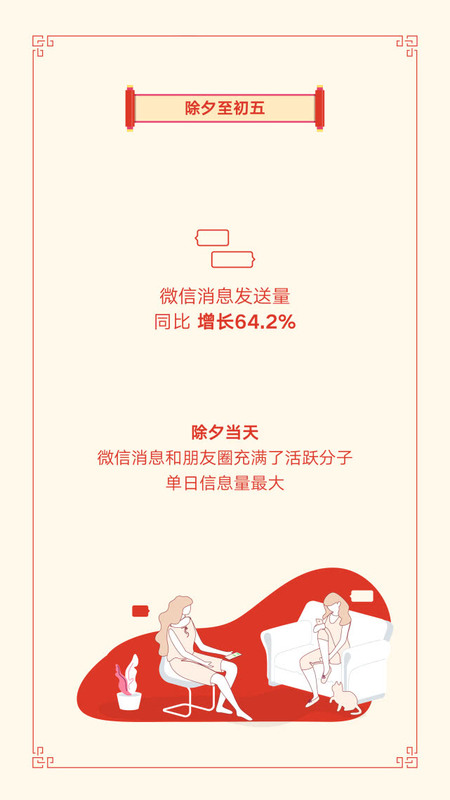 From New Year's Eve to the fifth day, the number of WeChat messages increased by 64.2% year-on-year, 823 million people sent and received WeChat red packets, and all WeChat mobile users out of 963 million steps.. … 1 billion live WeChat has inevitably become an important part of the Spring Festival component. 90 post-WeChat cross-year realization "six most", Beijing is called "annual red envelope city"
During the New Year's Eve to the fifth day, the number of messages sent on WeChat increased by 64.2% compared with the same period of last year, and 823 million people sent and received WeChat red envelopes, an increase of 7.12%. On New Year's Eve, users have the most frequent activities on WeChat, and the amount of information on one-day news and circle of friends has reached its peak. 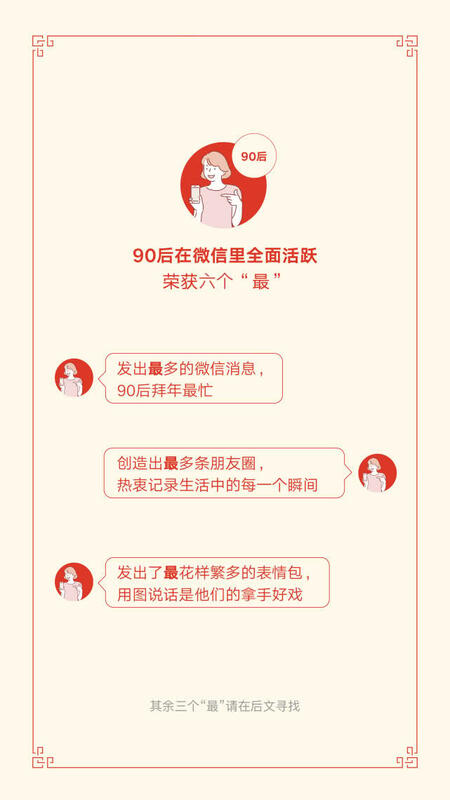 Among them, after 90, it is growing into the dominance of the mobile Internet world, achieving the “four most” messages that send out the most WeChat messages, the most friends circle, the most multiple expression packs, and the most WeChat red packets. 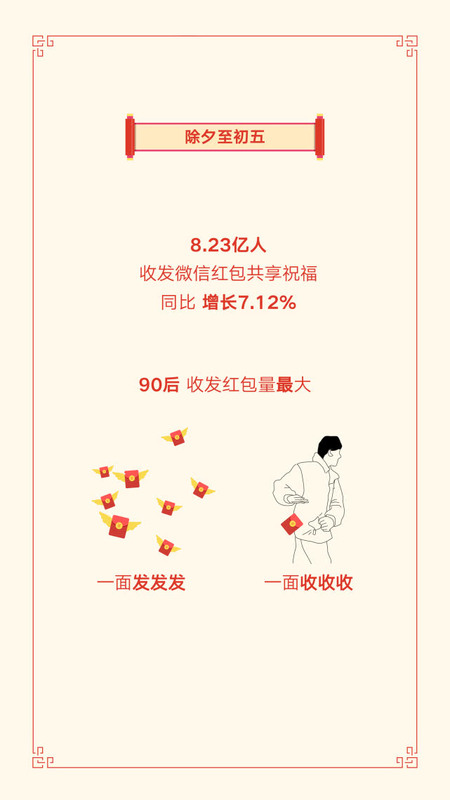 Compared with New Year's Eve, in the total number of red envelopes sent and received from New Year's Eve to the fifth day, Chengdu was replaced by Guangzhou in the top three, and Beijing, Guangzhou and Chongqing became the top and bottom of the red envelope. 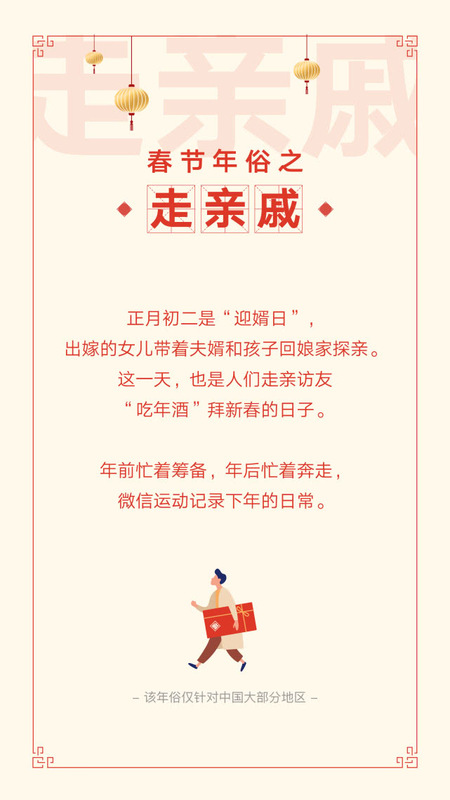 Among them, Beijing, which has the largest amount of transmission and reception, is known as “the annual red envelope city”, and at the same time, because the red envelopes are sent and received the largest amount, it has become the envied “the most loved and loved” city. 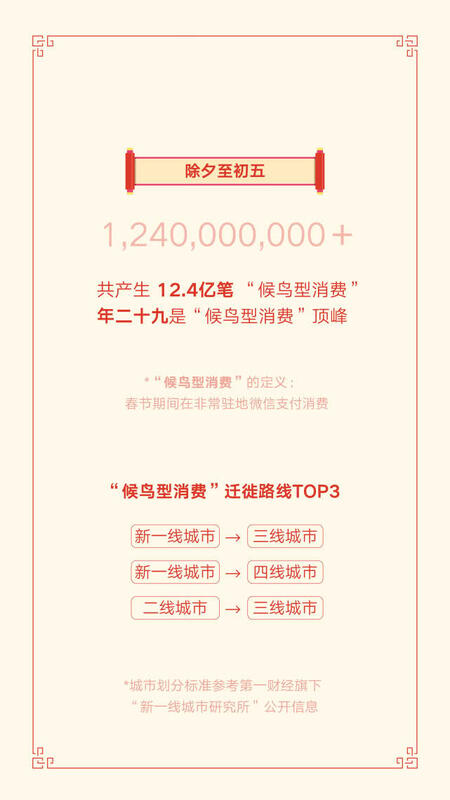 WeChat launched the WeChat red envelope custom cover, the New Year red envelope, and the red envelope type in the form of red envelopes. This year, the red box has become more interesting. 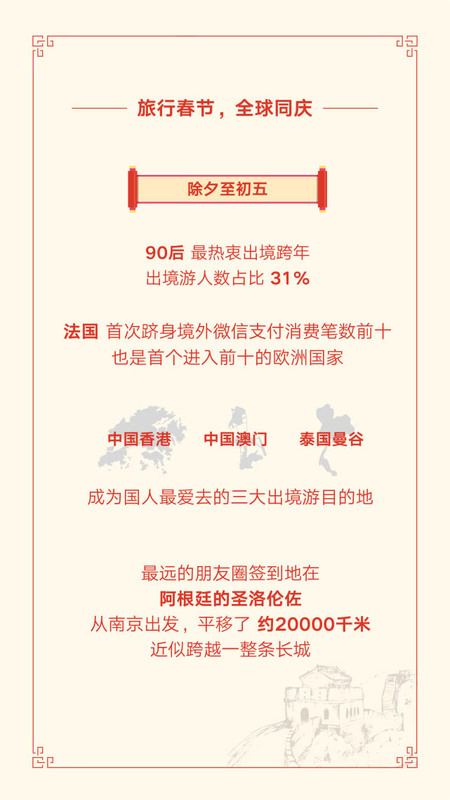 As of the fifth day, the characteristic red envelope with a custom cover has been opened for nearly 250 million times, including 26,000 companies specializing in its 20 million employees, and a local cover for overseas consumption. 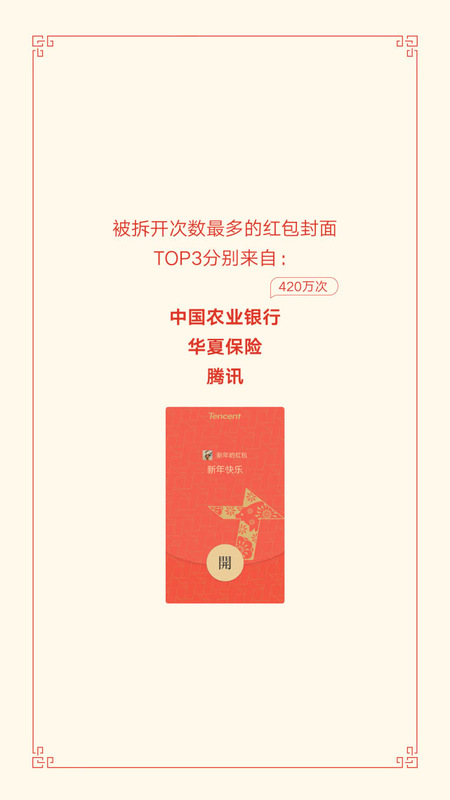 The top three custom red envelopes that were opened most frequently were from Agricultural Bank of China (4.2 million times), Huaxia Insurance and Tencent. The Spring Festival holiday is seen by many as a prime time for socializing, sports and charging. 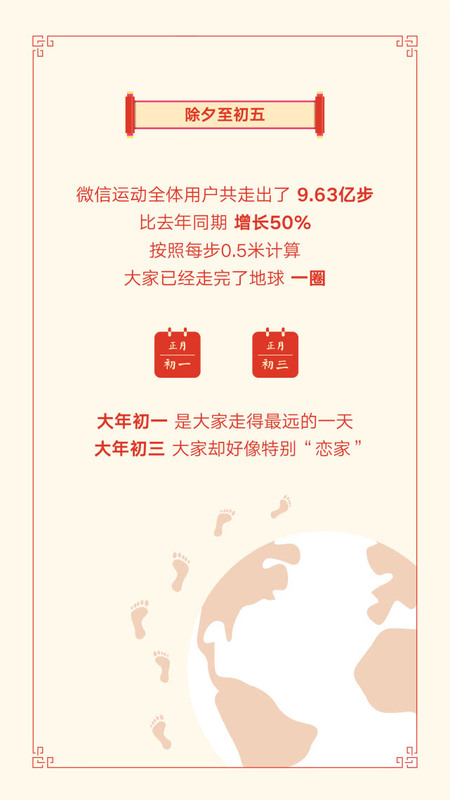 On New Year's Eve to the fifth day, all users of the WeChat campaign went out of 963 million steps, a year-on-year increase of 50%. According to the average calculation of 0.5 meters per step, all users of WeChat Sports have “walked through” the earth, of which 130 million people walked more than 10,000 steps. The number of national sports in the New Year's Day is polarized. 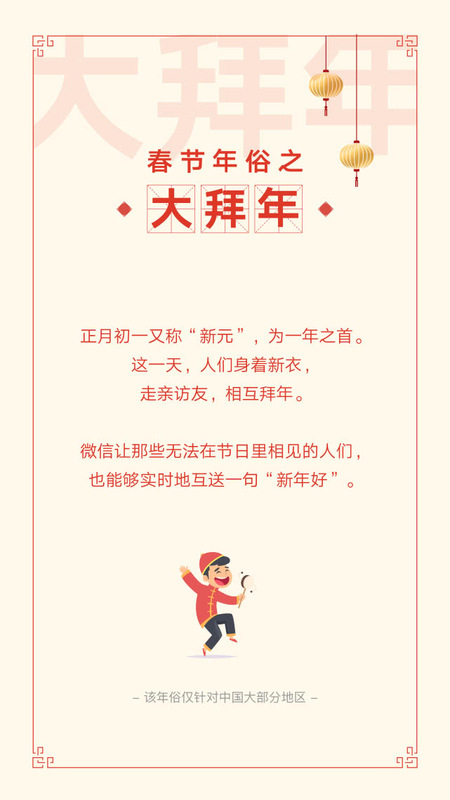 The number of people who have more than 10,000 steps in this day is the most, but at the same time, the number of WeChat movements is less than 100. 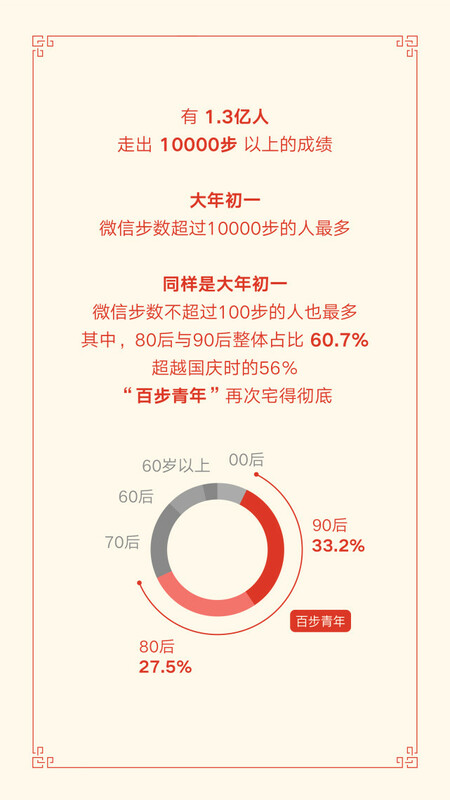 Among them, after 80 and 90, the overall proportion accounted for 60.7%, surpassing the National Day's 56%, this time "100 steps youth" "Houses are more thorough. 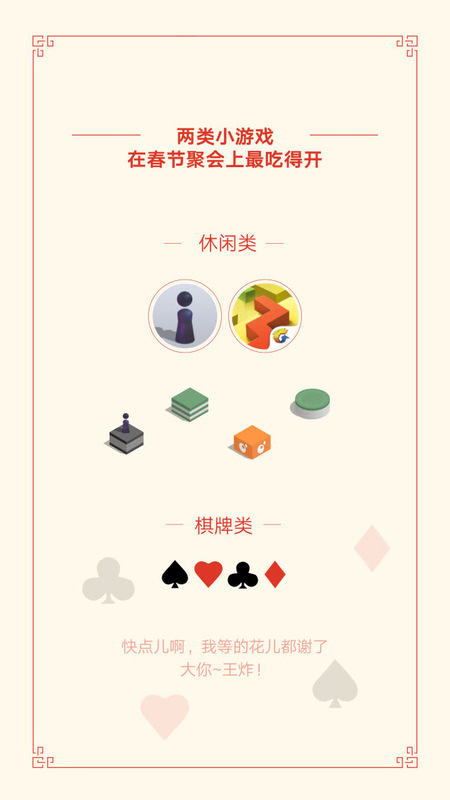 Many people choose to spend this leisure time with WeChat reading or small games. 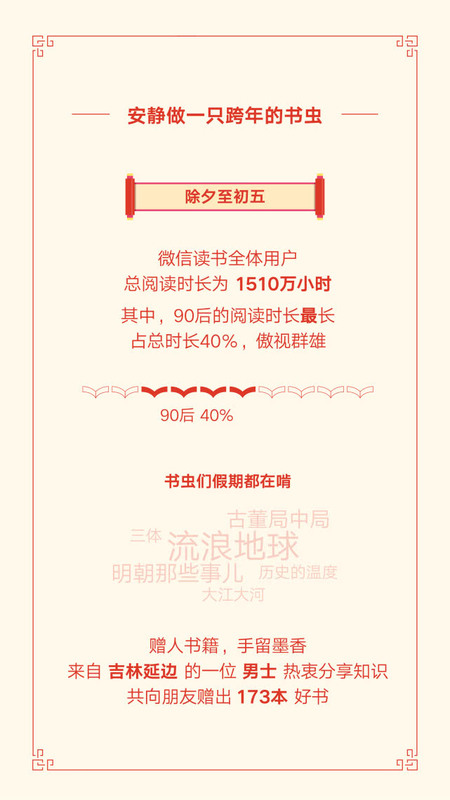 On New Year's Eve to the fifth day, WeChat read a total of 15.1 million hours of reading all the books, of which, after 90, a new "most", the longest reading time. The "Wandering Earth" fever produced by Tencent Pictures has led to the enthusiasm for reading the original book. 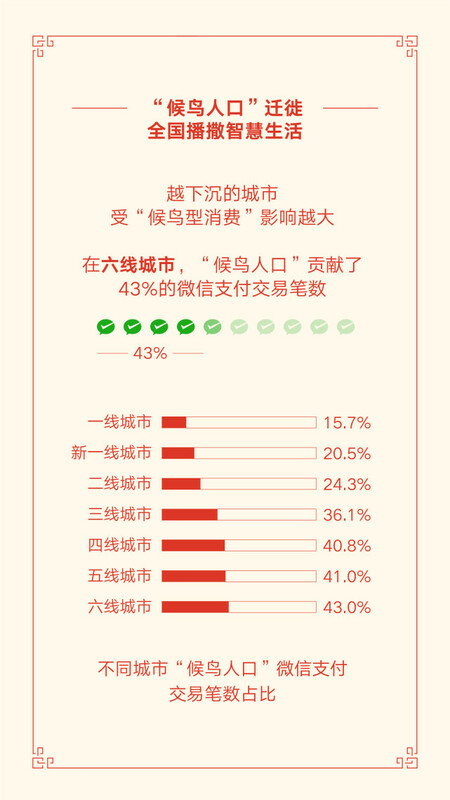 The WeChat reading data shows that "Wandering Earth" has become the most popular book of the Spring Festival. 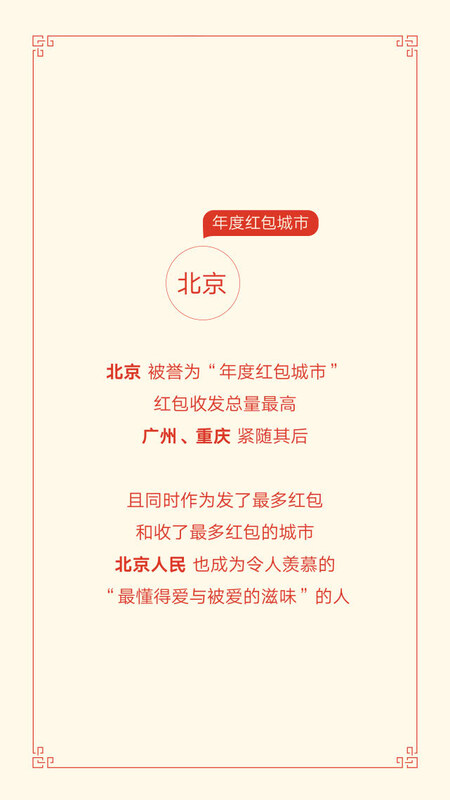 The gift-giving function of WeChat reading also gives social meaning to the book. A man from Yanbian, Jilin, gave a book to his friends during the Spring Festival, which is 173 books, which can be described as “gift books, hand-dyed ink” . Small games are also becoming a must-have item for the Spring Festival party. Among them, rest games represented by jumping and dancing lines and chess games represented by landlords are popular. During the Spring Festival, the outbound year has become a trend, especially among young people. This year, WeChat users have the highest proportion of 90-year outbound travel, accounting for 31% of outbound travellers. China's Hong Kong region, China's Macau region, and Bangkok, Thailand, are relatively close overseas destinations, which are still the preferred destinations for Chinese outbound travel. Thanks to the overweight distribution of WeChat payment to Europe, France became the first European country to enter the top ten for the first time. One of the users who left the country this year, from Nanjing, translated about 20,000 kilometers and arrived in San Lorenzo, Argentina. In the territory, along with the Spring Festival, there is also the growth of “migrant bird consumption”. WeChat payment and the smart lifestyle it represents follow the footsteps of returnees, sinking into low-lying cities, creating a proliferation of consumption habits and lifestyles among different cities. 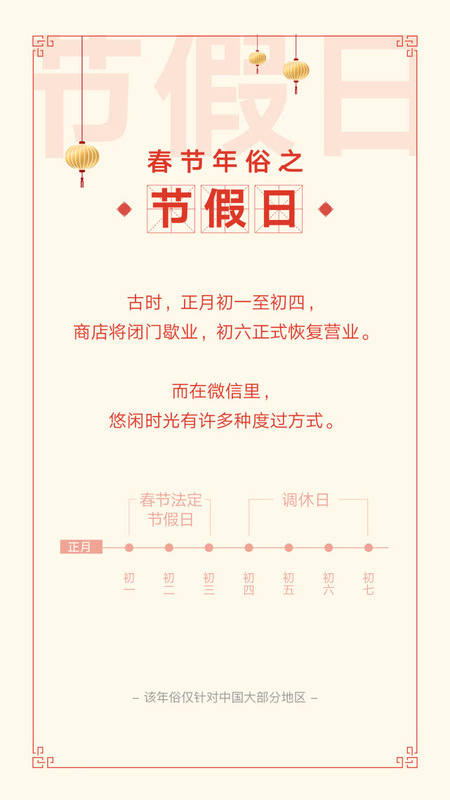 WeChat defines “migrant bird consumption” as “WeChat payment during non-resident period during the Spring Festival”. According to the data released by the public, during the Spring Festival, a total of 1.24 billion pens were collected nationwide, and the peak of the migratory bird consumption was . From the perspective of migration routes, it is not the first-tier cities that have set off the banner of lifestyle output, but the new first-tier cities. The WeChat payment from the new first-tier cities to the third- and fourth-tier cities is the largest. The data shows that the more sinking the city, the more affected by the “bird-type consumption”. These homecomings “the migratory bird population” not only brought back the way of consumption, but also brought back the smart life. In the sixth-tier cities, “the migratory bird population” contributed 43% of the WeChat payment transactions, and the 4th, 5th and 6th-line cities “the migratory bird population” accounted for more than 40% of the WeChat payment transactions.